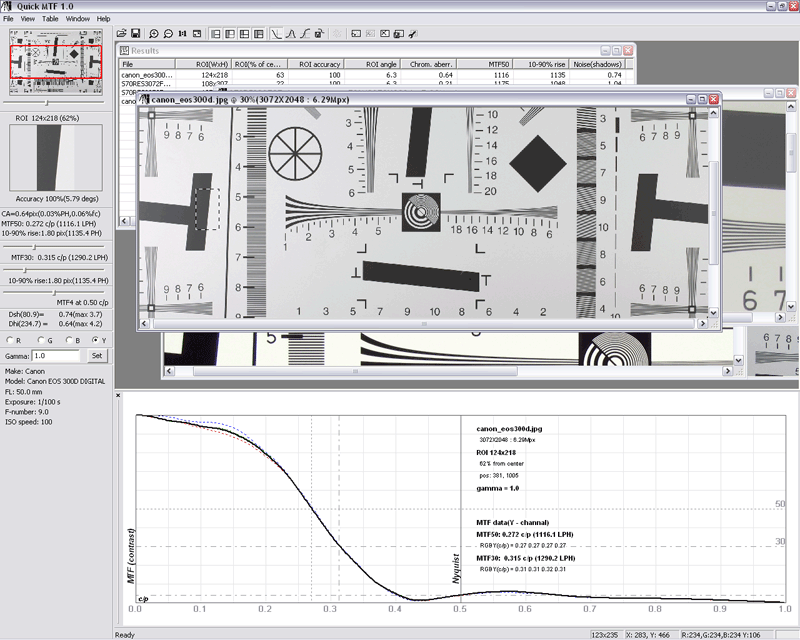 Quick MTF is a high-performance software designed for measuring the most important image quality factors. Whenever you are buying a new lens, a camera, or a scanner, Quick MTF can help you make an informed decision. All you need for assessing a device's quality parameters is a picture of a simple object taken taken with that device. Quick MTF uses the slanted-edge measurement technique for discrete sampled systems, described in ISO 12233. Software for quality testing of optical and other imaging devices. * As different samples of the same device model usually have somewhat different parameters, sometimes you have to check a few devices to select exactly what you need. Quick MTF lets you do that much more quickly and easily. * Image quality strongly depends on such factors as the shooting mode, the distance from the image center, the additional equipment used, and so on. Quick MTF can help you find out how exactly those factors affect the image quality. * The method implemented in Quick MTF is based on the ISO 12233 standard, so that you can test (as many Quick MTF users already do) not only camera lenses but also other imaging equipment. * Resolution, including spatial frequency response (SFR), also known as modulation transfer function (MTF); edge spread function (ESF); and line spread function (LSF). Quick Snooker is a very well snooker game. Image Quick Saver was designed to help you easily save web images quickly. Qweas is providing links to Quick MTF 1.15 as a courtesy, and makes no representations regarding Quick MTF or any other applications or any information related thereto. Any questions, complaints or claims regarding this application Quick MTF 1.15 must be directed to the appropriate software vendor. You may click the publisher link of Quick MTF on the top of this page to get more details about the vendor.